In 2009, Rich was on an exciting holiday in Cyprus with a group of close friends. One day, they were all scuba diving off the coast. Everything was going well, but suddenly Rich and his friends realised that they had much less air than expected – forcing them to rapidly ascend from a depth of 40 metres. While his friends only had minor effects from decompression sickness (commonly known as the bends), Rich sustained a complete spinal cord injury at T4 level. 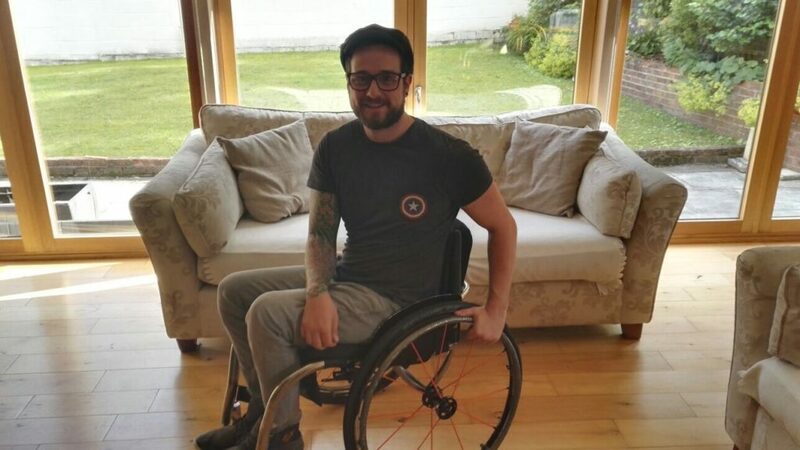 Rich went to the Glasgow Spinal Injuries Centre for his rehabilitation, and that’s where he first met Back Up, as a participant on a wheelchair skills session. The training had an enormously positive impact on Rich. He realised that with the right skills, he could still live a full life as a wheelchair user. It was in 2016 that Rich got back in touch with Back Up after his Dad remembered hearing about the courses and other services the charity offers. At that time, Rich wanted to challenge himself physically and see if he could still have a fun and active life as a wheelchair user. He certainly found what he was looking for. Following the course, Rich wanted to get more involved with Back Up. The wheelchair skills sessions during his rehabilitation had such a positive impact on his life that he became a trainer so he could pass on those vitals skills to other newly injured people. This is his first volunteer role, but one he’s taken to like a natural. Like many of Back Up’s volunteers Rich works full time. His job at Enable is a world away from the work he did before sustaining his injury. And while he knows there are jobs that have bigger financial gains, his priorities are more centred around giving back and supporting others. Looking forwards, Rich would like to broaden his reach as a trainer and develop his teaching style. When he was asked what the best thing about being a new trainer was, Rich simply said. If you would like to find out more about volunteering as a wheelchair skills trainer, please get in touch with our Outreach and Support Manager, Andy M, by email or call him on 020 8875 1805.